I had a seminar to attend tonight so my wife ate on her own some leftovers. By the time I got home and got to cook, it was getting close to 11p. I recently purchased a new variety of Sunshine Burger, the Garden Herb; we like these because they have good, simple ingredients, and are soy-free. I need to prepare a garden herb burger for my wife for her to try, but it was something quick for me to make tonight, so I did. 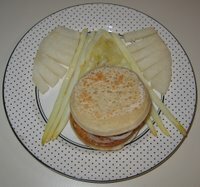 I served it on a wheat English muffin along with ketchup, onion, and roasted tomato. 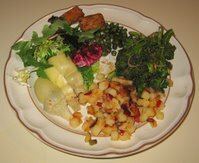 I also cooked some prepared potatoes O'Brien, and served a salad with Drew's kalamata olive and caper dressing. When we ate at an Indian restaurant last Tuesday, we brought home leftovers, including white basmati rice. I sauteed some tempeh and onion and, added a few minutes later, some asparagus cut into maybe 1" lengths. 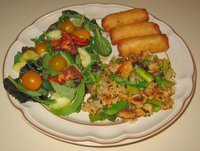 When the tempeh was nicely browned, I mixed in the leftover rice and cooked just another minute or two till the rice was heated. I transferred the items to a bowl and mixed in a little bit of soy sauce, just a little fresh squeezed lemon juice, and some salt. Today, I had purchased some frozen Ling Ling brand mini spring rolls and I included them in the dinner. They were easy to prepare (I just put them in the toaster oven for around ten minutes). Dinner turned out to be quite tasty. 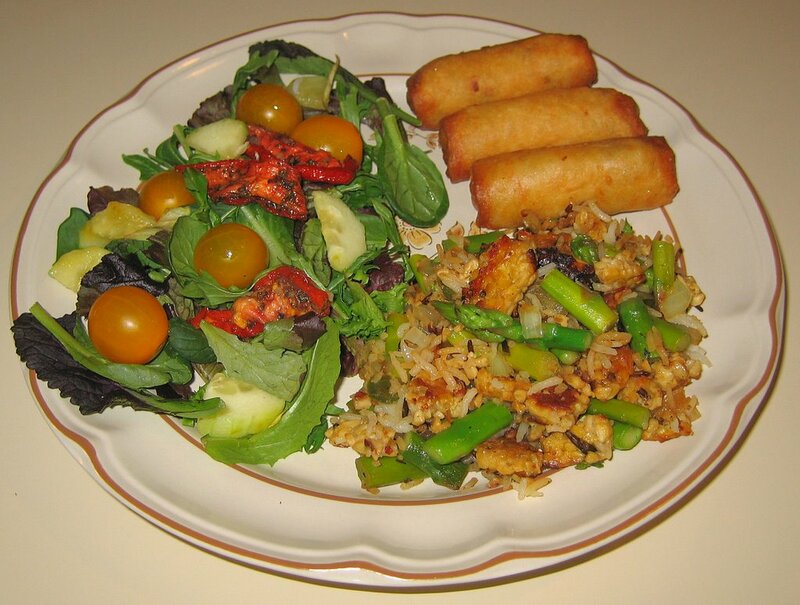 I'll try making similar dishes with rice mixed in, and will buy more of these spring rolls. I didn't do any cooking over the weekend. 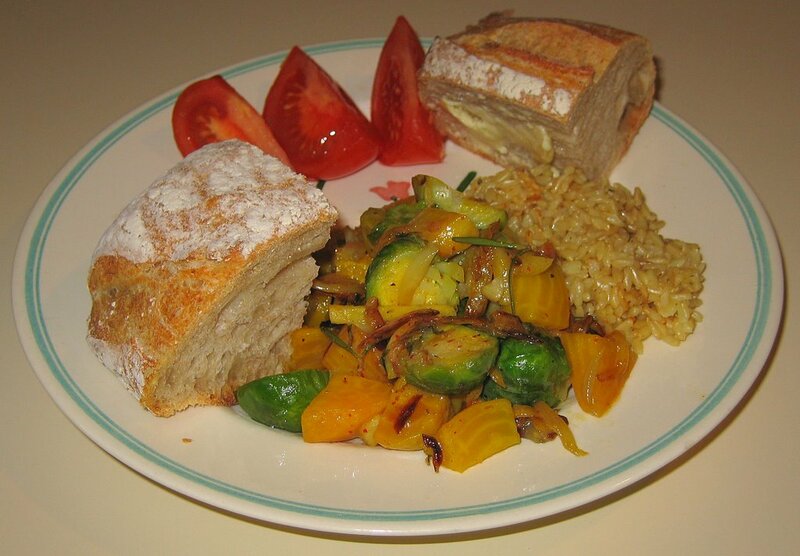 On Saturday, we had a nice vegetarian society potluck dinner at a member's elegant Cary, NC home; it was a nice, all-vegan spread, and we had maybe 15-20 in attendance. We brought a decadent vegan chocolate cake from Weaver Street Market. I was looking forward to making dinner yesterday, but my Mom called and said that she was making her delicious homemade pizza, so we ate there and then headed to an Oscar night viewing party at a movie theatre (and were so disappointed that Deepa Mehta's Water didn't get an Oscar!). I'm not sure what we'll do tomorrow; I'm taking a seminar from 6-9p so will have to either eat very early or late. I might make a simple early dinner - my wife said she can heat some leftovers for herself. My wife picked up some nice red Swiss chard yesterday. I made a dish a bit similar to rainbow chard (last June) and rainbow chard with chickpeas (last May) that I have made in the past. Using my hands, I shredded the leaves of the chard, pulling them off of the stems and cutting them into large chunks. I cut the stems into approximately one-inch lengths. I served the chard with trofie pasta (cooked for about 14 minutes) that I had sprinkled Eat in the Raw's Parma! 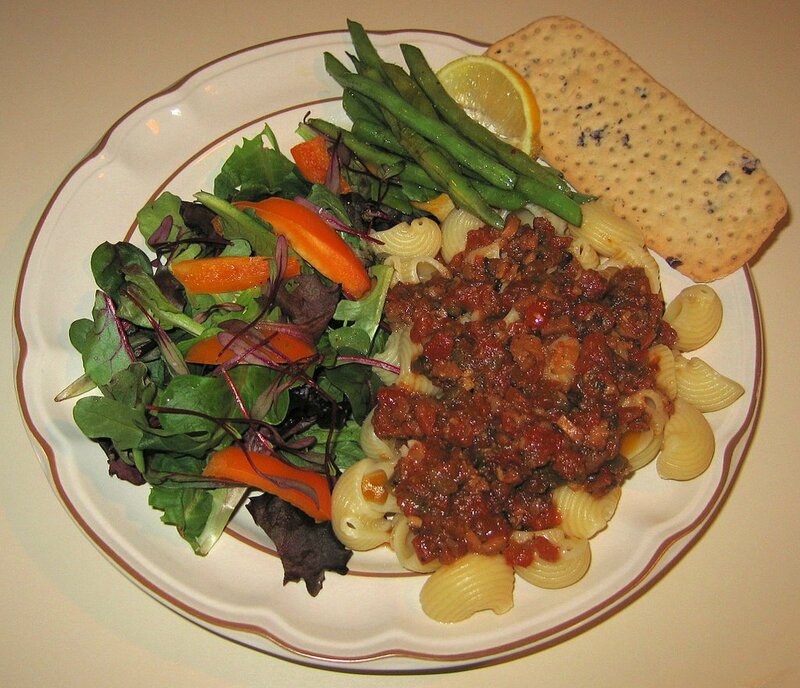 vegan "Parmesan cheese" atop, as well as some capers. I was excited that my wife found purple carrots yesterday, which we always find delicious and pretty. Some fresh toast and micro beet greens rounded out the meal. Yesterday after my photography class, my wife and I met a few friends on a business trip from California and we ate at Margaret's Cantina, which serves fairly vegan friendly Southwestern cuisine. We had some chips with salsa and guacamole and quinoa cakes for appetizers. They make awesome frozen drinks and two of us had their superb fresh mango margarita sans alcohol. I tried a sangria. For my main course, I had two cheeseless enchiladas - one with tempeh and one with grilled vegetables. My wife loves beets though I almost never cook with them. Recently, I found golden beets in the store and thought that I would experiment with them in my slow cooker, maybe making a soup. But when it came time to put together tonight's meal, I had just a few hours and not all day, so the slow cooker was out. 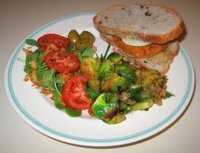 I saw an interesting golden beet and Brussels sprouts recipe on the web (the Simply Recipes blog by a woman named Elise Bauer), and modified it. I put three medium golden beets into a pan of boiling water, and let them cook for about 45 minutes. I also set some brown basmati rice to cook in my rice cooker, using a 2 to 1 ratio of water to rice and a cube of vegan bouillon, cooking for about 50 minutes. I removed the beets from the water and let them sit just a few minutes till they were comfortable to handle. I peeled them (they peeled easily and almost didn't even need a peeler) and cut them into chunks approximately 1" long and 1/2" in width and depth. I quickly parboiled some Brussels sprouts (from which I had removed a bit of the bottoms and the outermost leaves) in that same water for about 3 minutes to just cook all the way through. (I only had nine sprouts on hand, and used them all, but, though the recipe called for ten, think I would try something like this again with at least a dozen.) A few minutes later, once cool enough to handle, I cut the sprouts into halves. I sauteed medium slices of one shallot and one clove elephant garlic in a small cast iron pan till translucent, about 4-5 minutes. Then I added the beets and sprouts, as well as about a tablespoon of rosemary needles, and cooked for just a minute or two. I transferred to a bowl, added a little Baja Lime marinade, salt, and freshly ground pepper, and served with the rice. We really enjoyed the flavor! The recipe that I had found also incorporated a few tablespoons of toasted almond slivers and a tablespoon of thyme. Elise felt that thyme was important, but since I don't grow it, I used rosemary. I would like to try something like this again, but maybe include some potato and/or seitan as well. By the way, on Saturday we found at Weaver Street Market a new product, leftover Living Harvest brand Hempmilk™ made from hemp seeds. It's a nice product, creamy and refreshing, and I drank it with tonight's meal. Yesterday, I had a special guest in the Gandhian non-violence class that I teach, Thakorbhai Parekh. He is 90 years old and marched in the Salt March with Gandhi in 1930, and continued to work on Gandhian campaigns into the 1950s. I had met him at the recent Gandhi sculpture installation (you can see a gallery of images from that event, including several pictures of him speaking and with the sculpture). After class, we had a dinner in his honor at Sitar India Palace nearby. What a nice meal! I hadn't been there in some years, preferring when we eat out at Indian restaurants to go to the vegetarian South Indian ones. We had, for $13.50 apiece, all-inclusive, a big menu, all vegan and, as per Thakorbhai and his wife's diet, all without onions or garlic. We started with mango juice and samosas. The main courses spanned sampling both North (excellent channa masala [chickpeas] - some of the best I've ever had, aloo paratha flat bread stuffed with potato - the only dish I didn't like much, and basmati rice) and South (uttapam lentil-rice pancakes with coconut chutney, steamed rice cake idlis, and spicy sambar soup) Indian dishes. It was so good and so filling! We had a delicious vegan chocolate cake from Weaver Street Market leftover from this weekend, so brought that for dessert. A couple of Wednesdays ago I had made a chunky tomato-seitan sauce and was saving it to perhaps make a pizza out of it. My aunt was visiting from Connecticut and staying with us and I wanted her to try this sauce. 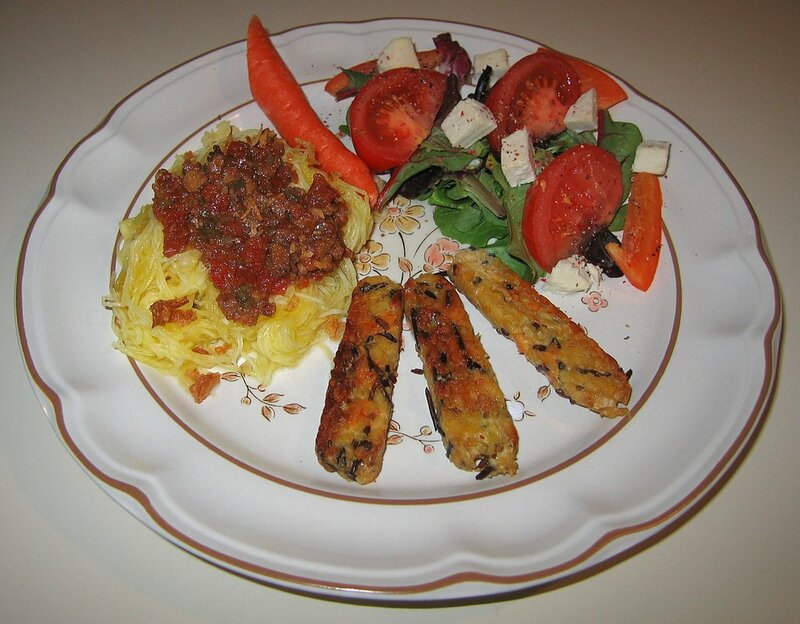 Instead of pizza, I made spaghetti squash, simply by putting it into boiling water for 20-30 minutes till a fork easily pierced the flesh, then cutting it in half and, using a fork, (easily) teasing out the strands. I served it with the sauce on top. I love the vegan cheese ("sheese") out of Scotland from Isle of Bute Foods, and opened their Blue variety. It tastes very good, and reminds me very much of what I remember Blue cheese tasting like (mind you, it's probably been over ten or fifteen years since I've had Blue cheese, and I had only had it a few times in my life). I made a simple salad and included chunks of the Blue sheese. Sauteed tempeh topped with hot sauce rounded out the meal. It was good though I wish I had made a bit more. We had a big party for my parents this past weekend. On Friday, my wife and I were given tickets by Fox Searchlight for a sneak preview of the upcoming release of The Namesake, which I am going to be reviewing (I'm the film reviewer for Saathee Magazine); we wanted to visit with family and not take time to cook after the film, so had a South Indian dosa (rice-lentil crepe) meal at Udipi Restaurant in Cary. The whole family went out to another South Indian restaurant on Saturday, Tower in Morrisville - I was delighted to have appam, a light fermented rice pancake that isn't always available. The party was on Sunday, and it was catered by India Palace North Indian restaurant from Morrisville - it was better than I expected, especially a chickpea dish. I've been eating out a lot! Before the weekend, I teach on Thursdays and we eat out. We had gone to Sage Cafe, a nice Persian vegetarian restaurant in Chapel Hill (check out the very nice recent article about it, including the rich faisanjan pomegranate stew recipe that I usually order). We went out tonight to see a play and wanted to get there early, so I didn't have much time to cook. We had some leftovers (quinoa salad, sweet potato tagine with tempeh) from our photo banquet this past Sunday at Café Parizäde in Durham, which I heated. 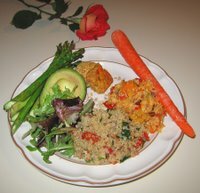 Other than some lettuce (though I tried to arrange that somewhat suggestively at the base of the avocado), the other foods that I served were meant to suggest romance - grilled asparagus (served with some lime, salt, and ground pepper), avocado, and carrot. I made a quick dinner tonight. I picked up a package of organic frozen Potatoes O'Brien, cubed potatoes, bell pepper, and onion (easier than cubing potato so small) and simply sauteed it, stirring occasionally, over medium-high heat in a little bit of oil for about 10 minutes. I quickly sauteed some broccolini for a few minutes till the green intensified, then reduced the heat and added some Baja Lime marinade, salt, and paprika - wow, that lime really makes the vegetable shine! I made a salad and served a few pieces of prepared balsamic roasted tofu. 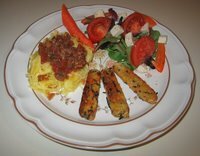 When we ate out last Thursday at a nice Italian restaurant, I was inspired to make an Italian saute similar to the one that we had that night. I took an 8 ounce package of baby bella mushrooms, and cut the smaller ones in half and the larger ones into quarters. I marinated them in pomegranate red wine and toasted garlic for about half an hour. In the meantime, I got some water boiling with a vegan bouillon cube. Once it was boiling, I reduced the heat a bit and put in some rainbow orzo (colored with vegetable extracts) - as a general rule, try using twice as much water as orzo, aim for about 8-10 minutes till al dente, and drain excess water/broth. In a large saute pan, I started cooking some onions cut into large chunks. 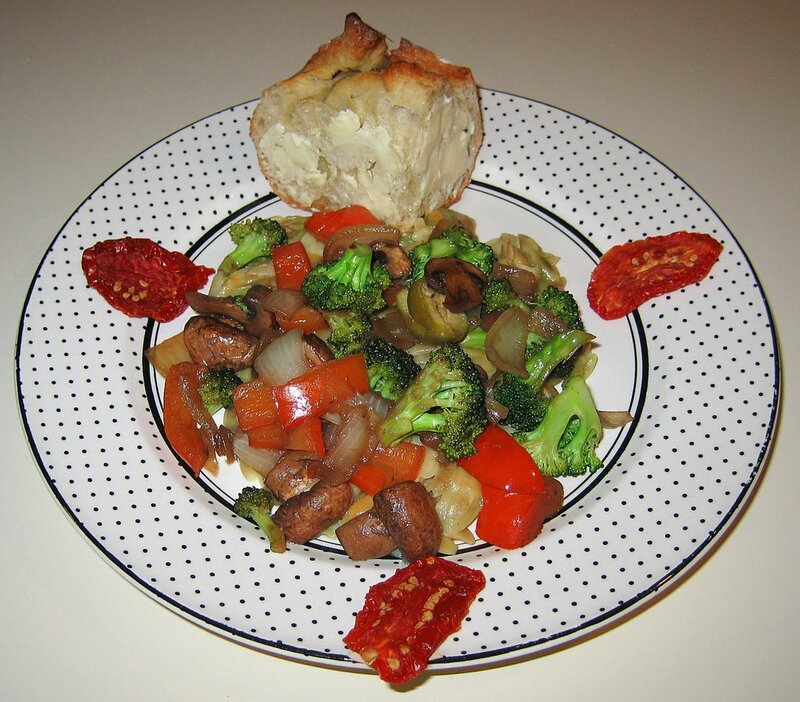 After a minute or so, I added other vegetables also cut into large chunks - orange bell pepper, broccoli, and the mushrooms (which had nicely absorbed the wine), and did a quick saute for maybe 5 minutes. Near the end, I added some halved olives stuffed with jalapeno peppers. I served this atop the orzo and sprinkled some salt and toasted garlic on top. It was a reasonable dinner, but my wife needed some sauce as she found it rather bland. I would enjoy making a similar dish in the future, but might work in some additional flavors. Yesterday, I hosted a photo competition at the restaurant where we have our annual Thanksgiving, and put together a good vegan menu of items like kale rollups (they didn't have kale so used spinach), a tempeh-sweet potato tagine, a quinoa salad, an eggplant dip, hummus, and several other items - and fabulous desserts including a great cherry biscotti, pastries, cookies, and fruit. As I was beginning to cook dinner tonight, a good friend (my Best Man from my wedding, in fact) called to say that he is flying back from a trip and could use a ride home from the airport. So we had the pleasure of having him over for dinner. I made a grilled "cheese" sandwich on a lovely Weaver Street Market olive bread made fresh today, out of the little bit of Bute Island Foods (Scottish) "cheddar" with chives that I had left, but mostly with their "blue" variety. This was the first time that I had their blue; unlike dairy blue cheese, it isn't veined but is simply white. It has been years since I've had blue cheese, but the Bute Island one is good and does taste like a mild blue to me! 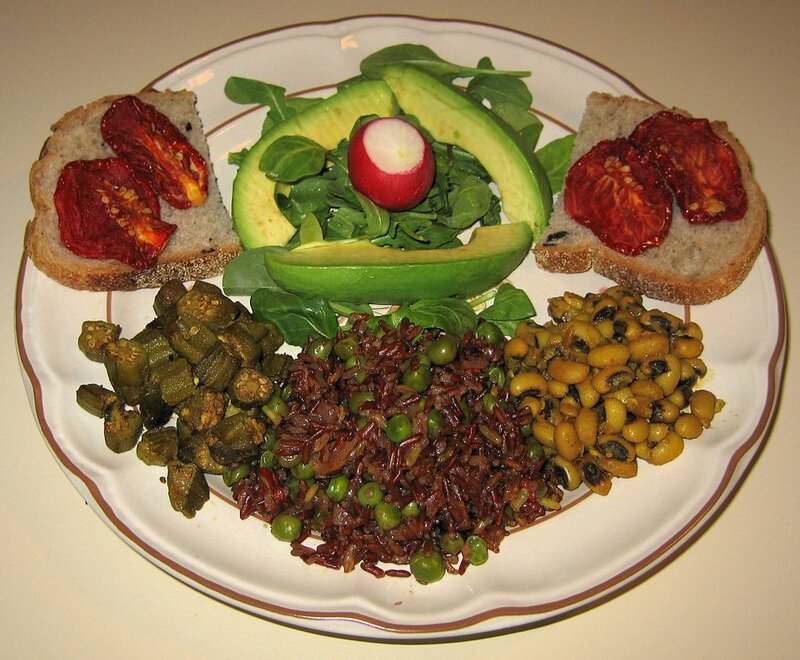 Salad (including micro beet greens) and brown basmati rice cooked in vegan broth rounded out the meal. 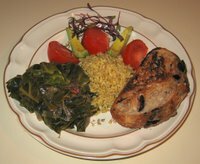 We all enjoyed it - the collards were good and the grilled "sheese" was quite tasty! Though my wife enjoyed dinner today, we were tight on time and I was a little embarassed to serve a meal like I might make in college, simple and not so interesting. Of course, I love my slow cooker for soups but have a few cans of soup in the pantry and need to use them up, so heated some Amy's Organic Minestrone Soup - I don't know why, but some of their varieties, including this one, have a strange taste to them. I made some mashed potatoes and tried mixing in Lars' Own crispy onions. 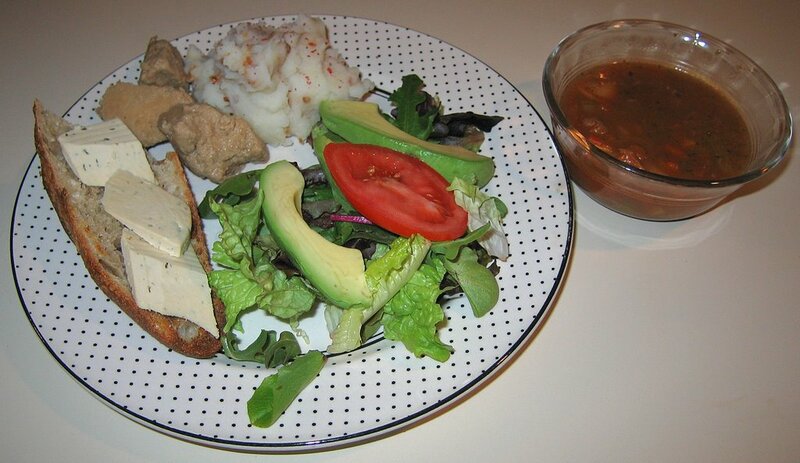 I also served the Scottish "cheddar" and chives vegan "sheese" atop a baguette and, to the side of the potatoes, served some raw seitan chunks. I haven't seen the hardcopy of my article in yesterday's paper, but did find it online; it seems reasonable. Yesterday after my photography class, we went to a gourmet southern Italian restaurant that we love, Trilussa La Trattoría in Chapel Hill. The owner chef, Florentine Giovanni Caligari, is a very accomodating and interesting man, great to talk with and who creates a social and gustatory experience certainly reminiscent of Italia. We trusted him to come up with family style servings of vegan choices, and had a nice salad and excellent sauteed mushrooms and vegetables for appetizers, followed by five shared main courses, including great gnocchi, good curried vegetables, black beans (good but beans can bother my stomach so I just carefully sampled a few), and grilled vegetables. It was a great hours-long dining experience that my wife and I shared with two friends visiting on business from California. The sauce that I described in the previous blog entry came out great! It simmered in my slow cooker on low from about 8:30a-8:15p, or almost 12 hours. It filled the conchiglie pasta nicely, though I wonder if it would have been even better if the seitan chunks were bigger. 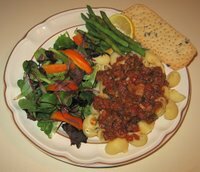 Like we had in the Toscano countryside in October, I made a simple green bean side, as well. I sauteed green beans over medium heat in a cast iron pan for maybe 10 minutes, turning occasionally. I simply sprinkled some fresh lemon, salt, and black pepper on top and served. Besides a salad, there was also some "Ciappine alle Olive" Italian flatbread with Taggiasche black olives (flour, olive oil, olives, salt, and yeast), a nice crispy accompaniment. My wife, unfortunately, doesn't like Mexican food - or so she says. I know that she loves my fajitas and today I made a tortilla salad that she really enjoyed. 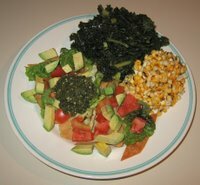 I started with premade wheat tortilla chips that I picked up at Whole Foods Market. I put some crispy lettuce, diced roma tomato and avocado, and spicy tomatilla salsa on top of the chips - that's it! I also prepared some corn off the cob, as I usually make it. I roasted the corn on an open flame on my gas range, stripped the kernels using a knife, and served it with some Earth Balance margarine, salt, and lime juice. 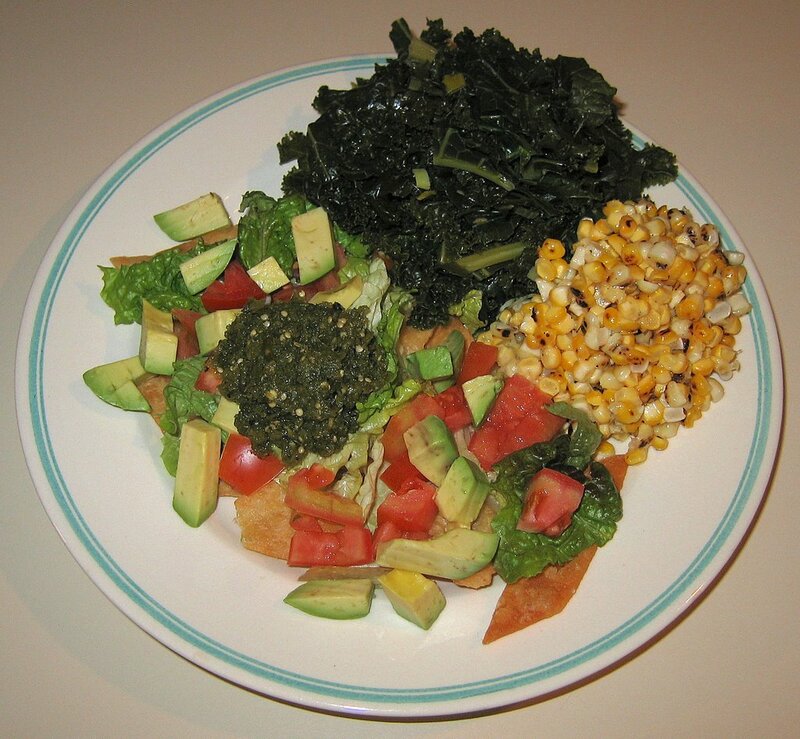 Finally, I prepared kale. I quickly sauteed leek (after first washing it carefully, cutting it down the length and washing again, then slicing into half discs) for maybe two or three minutes, adding some cumin seed in the last 15 seconds or so. Then I put water in the pan along with a bouillon cube and salt, and brought to a boil. In the meantime, I had hand stripped the kale leaves from the stems, roughly shredding the leaves to bite size. I cut the stems into approximately 1-inch lengths. Once the water was boiling, I added the cut stems, then about 5 minutes later added the leaves. I cooked for a total of about 10 minutes till the stems were reasonably tender. We're excited to have a friend over for dinner tomorrow. She is visiting from New York on business and coming over to see us. We're so in love with the sauces that the slow cooker can make that we're making pasta for her. Just like I did in mid-January and a week later, I prepared tonight the sauce ingredients; what I am trying new is to use some well sauteed small chunks of seitan, as well as some bell pepper. Tonight, I had my wife finely chop and de-seed 9 medium roma tomatoes. I very finely diced 5 cloves of garlic, 3 shallots, and 1/2 onion, and less finely chopped a few tablespoons of green bell pepper and about half of a box of seitan. I sauteed the seitan for a good 10 minutes to brown it then added the vegetables, sauteeing just 5 minutes or so more. I added the contents of the pan into the slow cooker, where the tomato pieces already were waiting. I put in a few tablespoons of olive oil, a little salt and pepper, 1/3 t dried oregano (we've had some very cold weather, making my oregano finally dormant as of a few days ago), and 2t basil (I found at Trader Joe's frozen cubes of fresh basil!). I've asked my wife to turn the slow cooker on to low at around 8a, which should give it about an 11-hour cook time. I can't wait for the wonderful smells I expect tomorrow afternoon! I received a phone call from the Raleigh News and Observer newspaper today. They are doing a story about vegetarianism and will publish an article the day after tomorrow. I hope that it comes out well and will link it in to my Friday blog entry since we're eating out after my class on Thursday. I happened to also be mentioned in a bicycling article back on February 1. Tonight, I made several fairly quick dishes. 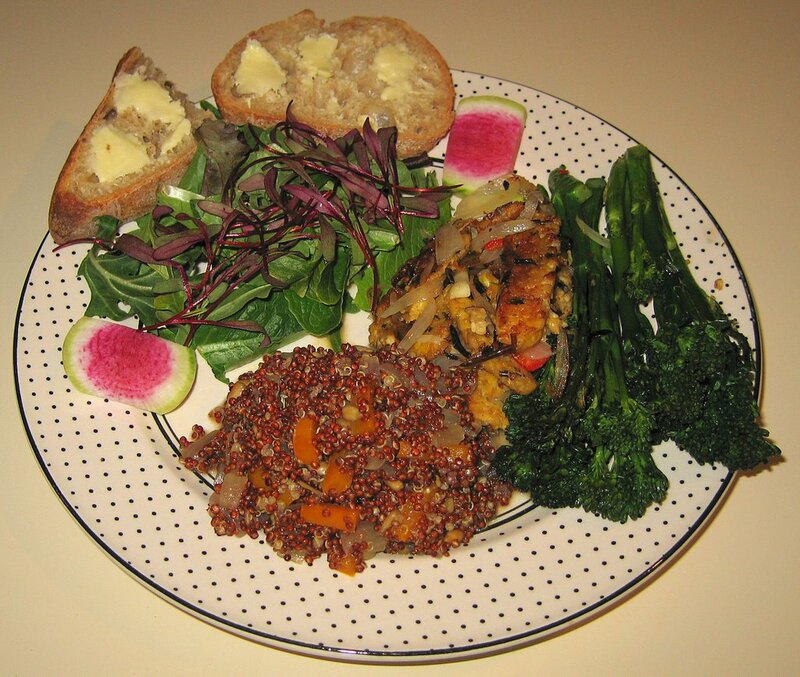 I sauteed some bell pepper and onion then put them into a sauce pan with heirloom red quinoa and water (in a 1 quinoa : 2 water ratio), as well as about 1/4 of a vegan bouillon cube. I brought this to a boil for 3-5 minutes, then turned the heat off and let it sit for about 15 minutes, covered. When I was ready to serve it, I mixed in some roasted and salted sunflower seed kernels, as well as Consorzio brand roasted garlic marinade. I also sauteed some red jalapeno pepper, shallot, and tempeh with broccolini. 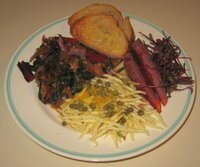 I found in the grocery store today some micro beet greens, and put them on top of the other mixed salad greens (the micro greens tasted to me a little of beets, though my wife didn't think so). I also served some beautiful watermelon radish. I was thinking of grilling some white asparagus and experimenting with jicama, a root that is typically eaten raw in salads, maybe with lime and salt. I noticed that these items are white - why not try an approximately all-white dinner?! I peeled the asparagus, necessary for the white kind which results in growing the vegetable in decreased light and gently grilled them with finely diced onion, being sure to cook it just enough so the the onion wouldn't carmelize (maybe 3-5 minutes). I served the jicama in pieces around the perimeter. I rarely purchase crumpets but happened to purchase some a few days ago. 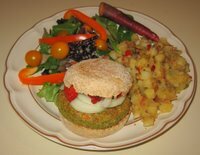 I had two GardenVegan Garden Burgers, and simply prepared them by grilling with very little oil. I served them, along with a roasted eggplant "caviar" spread, tomatoes, and onion (all carefully hidden from view except the white onions and a bit of the pale burger! 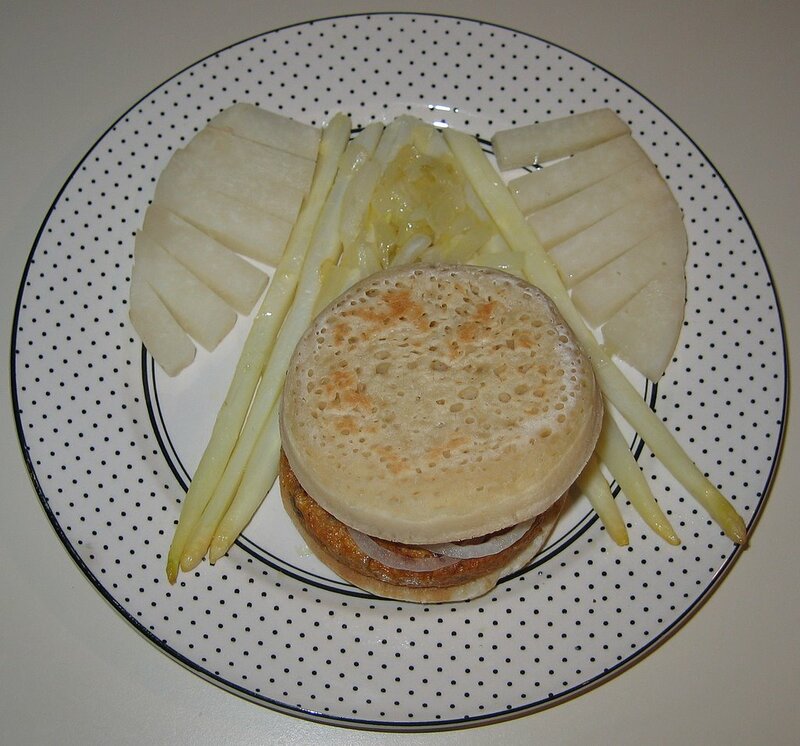 ), in between two crumpets. Normally, I'd put the flat side out, but it was brown, so aesthetics dictated reversing them! When we ate at my parents' house on Sunday, my Mom sent us home with leftover okra and black-eyed peas. I heated those and made a pilaf out of a special rice, Himalayan Red. It's a whole grain rice, more fragrant and maybe more nutritious than brown rice, and we enjoy its taste. I quickly sauteed in canola oil finely chopped onion, ginger, and red jalapeno pepper (maybe a few tablespoons onion, less than a teaspoon of ginger, and a teaspoon or so of pepper) for a minute or so, then added the rice and stir fried it for a minute or so, adding 1/2 teaspoon or so of cumin seeds in the last 15 seconds or so. Then I added 1.5 times as much water as rice, a pinch of turmeric, and a little salt, and brought the pilaf to a boil. I reduced the heat and simmered, covered, for about 45 minutes. In the last 10 minutes or so, I quickly uncovered the pan, added some frozen peas, and recovered. 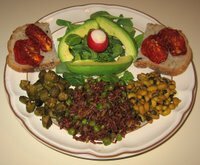 I know that olive bread doesn't match this dinner, but we had to use up what was left. 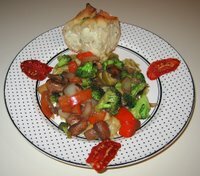 I served the bread with sundried tomatoes. My parents are celebrating a big anniversary on Sunday! We are going to be enjoying a variety of events with them and are going out anyway tomorrow since we won't have time to come home in between an art exhibit reception and a film that we are attending. So my updates may be spotty till Monday. Oh, normally we eat out on Thursdays when my photography class is in session, but there was bad weather projected for today, including perhaps 1/4 inch of ice. The facility where I teach closed due to weather, but it turned out to be a false alarm. So I cooked! I don't think that I've ever eaten any Garden Burger products, as most of them seem to have eggs and/or dairy, but I found a week or so ago that they have a GardenVegan variety that also has no soy (soy sometimes bothers my wife, except tempeh and in small quantities as in the Earth Balance margarine that we use). It filled the bill today when I got home again well past 8p. 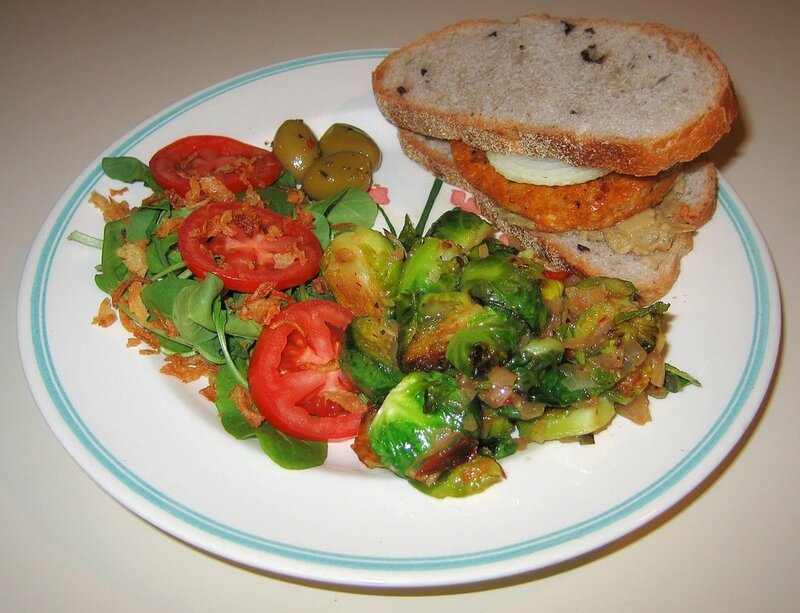 I made a quick meal by first sauteing Brussels sprouts, adding finely chopped shallot late in the process. I removed the sprouts to a bowl, and added a little salt, pepper, and Consorzio brand roasted garlic marinade. Then I used the same now-empty pan to quickly pan saute the burgers, and served them on black olive bread with an artichoke tapenade spread. Earth Fare has some good stores in Asheville, where it was founded, but their Chapel Hill store has never seemed to get much traffic - which didn't surprise me as they located themselves just 1/4 mile or so from a successful Whole Foods. Anyway, today the Chapel Hill Earth Fare finally closed doors - I think I was their third to last customer. (In its place, a Trader Joe's is opening!) At Earth Fare in their 30% clearance, I picked up some gourmet fried onions - Lars' Own crispy onions. I sprinkled some of them atop the salad that I made. We both enjoyed dinner and liked the burger. However, I didn't like the burger as much as Turtle Island Foods' Super Burger (which I prepared a month ago) or Sunshine Burgers (which I, most recently, served just a few weeks ago) - but I would certainly buy the GardenVegan again.